Been playing with some broom handle, copper end stops, and a big hammer! The resulting boppers seem not too bad, but I think the dome on mine is still a bit shallow. Anyone found an easier way to shape the end caps? I've shaped a bit broom handle and use it as the mould, and 3/4 filled the caps with lead. I now have a 15mm bopper, and a couple of 22mm boppers. I've never made a bopper myself, I saw a vid on you tube of someone making one though. He hammered the copper cap round, I guess the round end of the broom could come in handy for that. I seen people use flat boppers but I doubt I could use one myself. Also boppers you but commecially are weighted with lead. I do have a few stone tools, but have found that I'm using the bopper more. It just feels more comfy for me. Love the idea of experimenting with the different tools. I still mostly use boppers, I've only recently tried to move away. They definately make knapping easier, generally if you can't knap something with a bopper, you're most likely not going to be able to knap something with stone. This was something I was thinking about the other day, the best way for a beginner to start knapping. Authentic knapping seems to be the way most people start it in the UK, fail to get resutls and give up pretty quickly. Whereas in the US where there's a huge knapping community many come to it using modern tools, buying preforms or sawn slabs and even FOG. Many master increasingly harder methods over the years until they become experts using totally authentic techniques. The fact they were getting results all the time taking a few short cuts kept them inspired to stick at knapping. I learnt flint knapping the hard way, by starting with a hammer, then stone, then by buying some over priced off-cuts of antler from a walking stick maker. About 3 years ago I was finding it still frustrating, and decided ether I quit or make a damned good go of it! That was when I looked at the tools I was using and decided to make some boppers etc. I can fully recommend B.E.S plumbing supplies as they seem to be one of the few places you can get copper end caps that are bigger then 22mm, I ordered a 22mm, two 35mm, one 44mm, and two 52mm and they where delivered the next day! Good work. I used a ball pien hammer in a vice round end up and using another hammer, tapped them into a dome, this can take a while but it's worth it. It is also a good idea to look at spare file handles, and dry branches to make into handles, my largest bopper has a handle made from a round sectioned fence post! The lead came from a friend who gave me some off-cuts of roofing lead, but you can get fishing weights for a reasonable price. This was melted in an old ladle (one without a plastic handle) with a blow torch (outside) and poured into the caps. How you hold the caps on is up to you, epoxy resin works for a while then the bond will break, so you will have to stick them back on agian. The way of fixing on the caps I use is just to get a good fit on the handle and using a sharp nail punch, hammer the copper into the sides of the wood handle at intervals. No glue needed. The boppers i made are still in service but look a bit battered, all apart from the 22mm one which is the one I use the most, that has been replaced twice. I still have a couple of spare caps for the 35mm and 52mm boppers when they do eventually wear out. I also made a range of pressure flakers, Ishi sticks palm pads, horseshoe nail notchers, and got some good gloves. I'm really glad I did because knapping is a joy now, The copper tools help but it will always be a complex and tricky thing to master, this is why I like it so much!! I've got round to making couple of Ishi sticks a few weeks ago. The do make pressure flaking a bit easier, as I feel the long stick makes everything more stable. Will look into B.E.S. for the copper end stops. Never got the hand of them myself, used my Ishi stick as spare parts for the pressur flakers. They are a rather love or hate thing. People who love them say you get much more power than with a pressure flaker, I've try holding them the way you are supposed to, but never been closed to getting as much pressure as I do with a flaker. Agree with the extra power thing, doesn't work for me either. There again, still trying to get the hang of this pressure flaking. I understand, I went to the effort of making my first ishi stick and then dicovered that I didn't get on with it! It took a bit of getting used to but now I use them all the time for pressure flaking. I say "them" as I have two that I use in combination, one which has the usual pointed copper tip and the other has a blunt flattened tip (kind of like a flat screwdriver) this is never sharpened and is great for crunching the thin edges off bifaces and for preparing the edge for invasive flaking. the corners of the blunt ishi stick is also good for invasive flakes on tough platforms! The handles for these where made from straight sticks, one is Ash and the other is Sycamore. Must admit, I now just use the Ishi sticks, in fact, it's been months since I last used my little pressure flaker. As for the copper boppers, I finally got round to making a 52mm bopper, and I love it. The weight just carries through how I want, and probibly sounds a bit daft, but it's the first flint knapping tool I've used that feels like an extension of me. I can't work out how you hold them, or get any pressure with them. Also I wonder if you can insert antler instead of copper in the end. I've never heard of this on an ishi stick. Have you tried an antler Ishi stick yet? I suppose there's no reason you couldn't fit antler in the end, although the antler will be thicker than copper. You may have to 'beef up' the end binding and/or use a thicker Ishi stick. It might be better to use some copper tubing to 'clad' the end of the stick, instead of binding it. some good pointers - i might make a few of the copper boppers later in the week if i can find a spare day, although i usually like to do things how they would of been done at the time of use i think as mentioned i better learn with modern tools. I figure there's no harm in trying as many different tools for knapping as possible. I suppose it's a way of seeing how different materials work with the flint. the barnacle wrote: some good pointers - i might make a few of the copper boppers later in the week if i can find a spare day, although i usually like to do things how they would of been done at the time of use i think as mentioned i better learn with modern tools. I'm personally a fan of learning as easy as possible. When you learn in the UK they tend to give you stone age tools and nodules of flint. I think people tend to get poor results and give up quickly due to the difficulty. In the US where the hobby is huge people start with modern tool monstrocities and knap preforms or slabs of soft materials. Still not easy but you can quickly get results some results so are encouraged to stick with the hobby. Later as you get more experienced you can move on to spalls, flakes and more authentic tools. This is of course unnatural and not the way prehistoric people learnt but prehistoric learnt from children and had full time to practice, not a couple of hours a week. Next level of difficulty up there are slabs, basically flat pieces of sawn material for pressure flaking. Simulates the effect you have successfully a thinned a piece by percussion and can move straight on to the pressuring. Then ready made flakes (small) and spalls (large) simulates you have struck a perfect piece off from the nodule, ready to pressure or percuss. Many of the instructional vids start from the spall stage. Very true, although I would advocate having both antler billets and copper boppers and try to use them as much as possable, that way both tools will feel natural. Another point to note with the American knapping industry is that they have a dazzling array of different cut rock to buy and many of them come pre-heat treated. Yes I have purchased some American rocks and tried them out, they can be very pretty and its also very interesting to see how other rocks knap. Also stuff like Brazilian Agate and Australian Mookite can be stunning. I would like to get my hands on some of those slabs. I've checked out some websites, but the postage is still a bit too prohibitive. Have noticed of late that American sellers are starting to do better deals on posting to the UK. At the beginning of last year, I saw an item for sale for about £10 (a bargain! ), but the postage was £114. Didn't by it. Try typing 'obsidian knapping' as a search in Ebay. Wonder if I can get a friend to bring back a lump or two next time he's in America. I got hold of some Cornish Obsidian off Ebay a few years back. Scotland has obsidian too, though not got a clue where it is, a geologist at a Scottish university would most likely know though. It seems that there is an obsidian/volcanic glass-like material called pitchstone which can be found on the far western edge of Scotland, including Arran. See link below for more details. But I do wonder how he explains my Cornish obsidian. 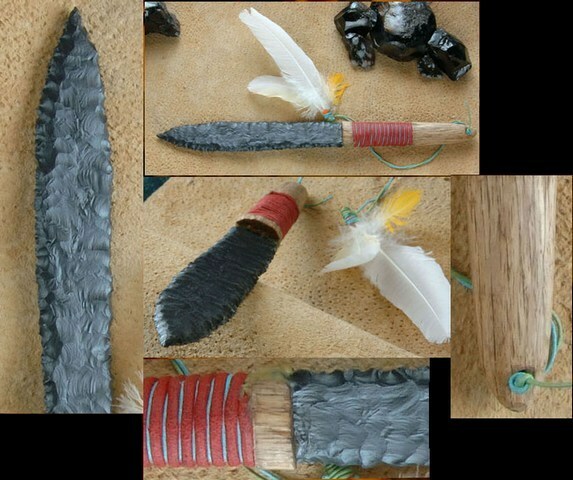 The blade is Dacite but the black rocks used as decoration in the top picture are obsidian from mine in Cornwall. 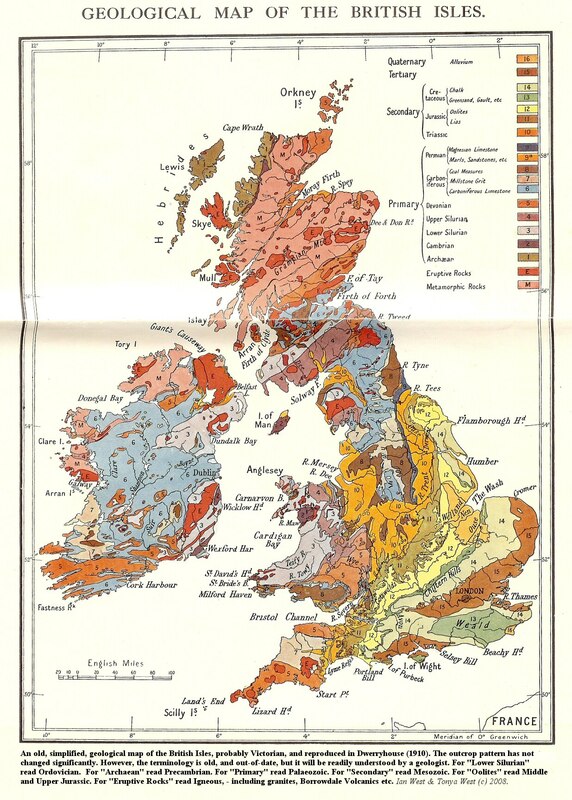 A quick google search for Cornish pitchstone reveals numerous geological books saying it's common there. The obsidian I have from their is slightly matte compared to foriegn obsidian and opaque, so perhaps it's a very pure pitchstone rather than obsidian, it's certainly as glassy as obsidian though. If you look at the red areas, most marked with an E, several in Cornwall, big one in Tyneside and Cumbria, massive ones on Skye and Mull and dotted all over the rest of Scotland. These are either volcanic fissures or volcanos and where volcanic rocks such as obsidian, pitchstone, dacite and so on is likely to be located. Also where there's chalk there's flint and where there's limestone there's chert. Methinks I'm going to have to study this a bit more.....I used to live next to an old volcano (Edinburgh), and I now live a couple of mile away from old limestone workings.